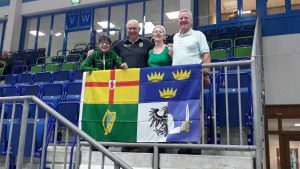 A defeat for the Irish in their first game in the World Mixed Championships in Kelowna, BC, going down by one shot to an Australia quartet after a very close contest. Australia, wit the hammer opening proceedings with a two at the first end. Ireland – James Russell, Ailsa Anderson, Arran Cameron and Katie Kerr – took a single at the second, but Australia raced in to a 4-1 lead with a second deuce at the third. 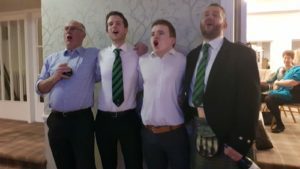 Ireland got another single before the half time break to peg the score back to 4-2. 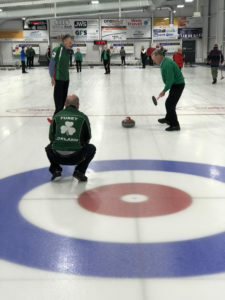 After a chat with coach Steve Callan, the Irish tightened up their defences and single were swapped over the next two ends before the Irish stole a two in the seventh end to level the game at five all. 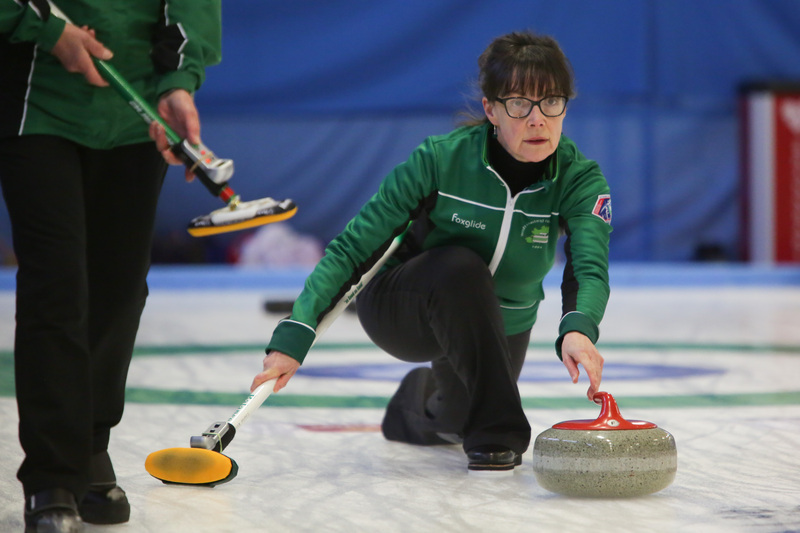 But the Australians made use of the last stone in the eighth and final end to record a 6-5 win. Louise , Bill, Frances and Ian. 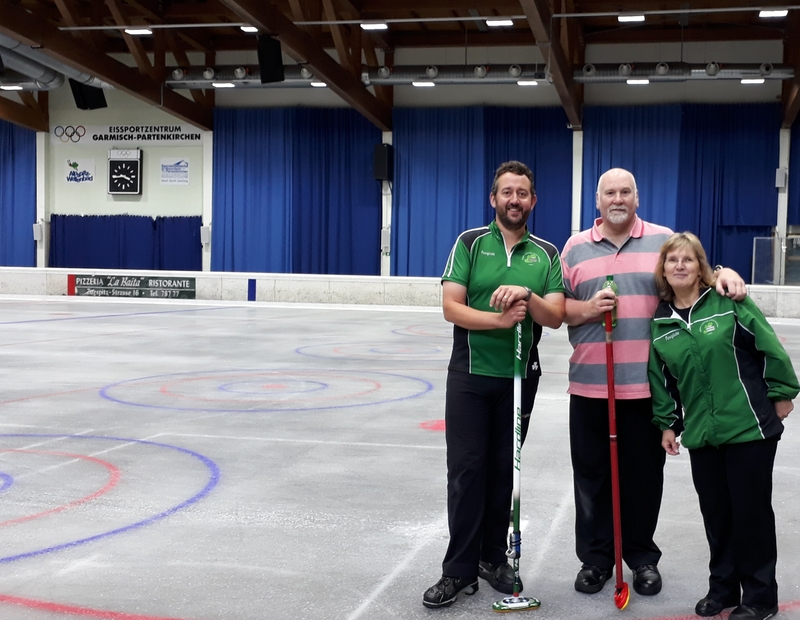 Two rinks from the ICA took part in the summer bonspiel over in Garmsich-Partenkirchen, Germany, last week with the ‘Paddy Power’ team of Bill Gray, Louise Kerr, Ian Donald and Frances Donald winning the low road. 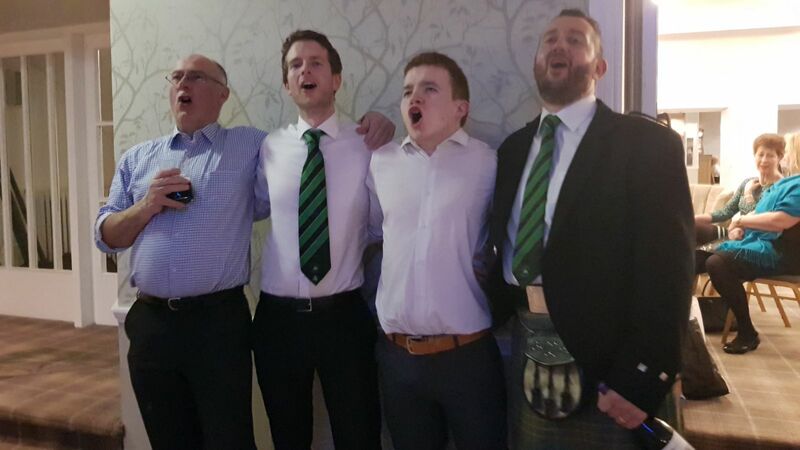 The other team, called the ‘Green Giants’, consisted of Johnjo Kenny, Arran Cameron and Gillian Russell. They played their way into the top league but had a bad last day on the ice to miss out on top spot. Unfortunately, the fourth member of that team had to withdraw from the event due to illness in her family. The ice in the imposing Olympic stadium was a challenge for all the teams due to the very warm conditions outside, making the ice both heavy and frosty, and some of us had to re-boot our backswing delivery to get the stone to the other end! 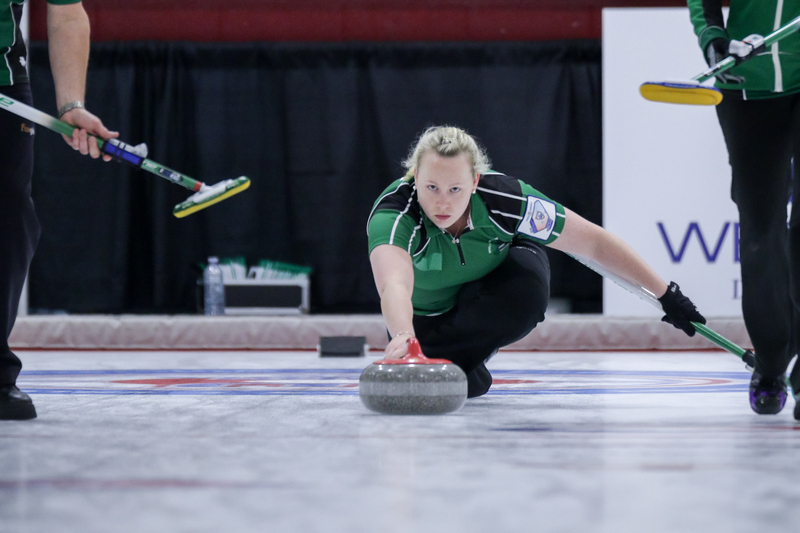 The ice did improve a little on the second and third days and the ice makers worked tirelessly to make it as playable as possible. 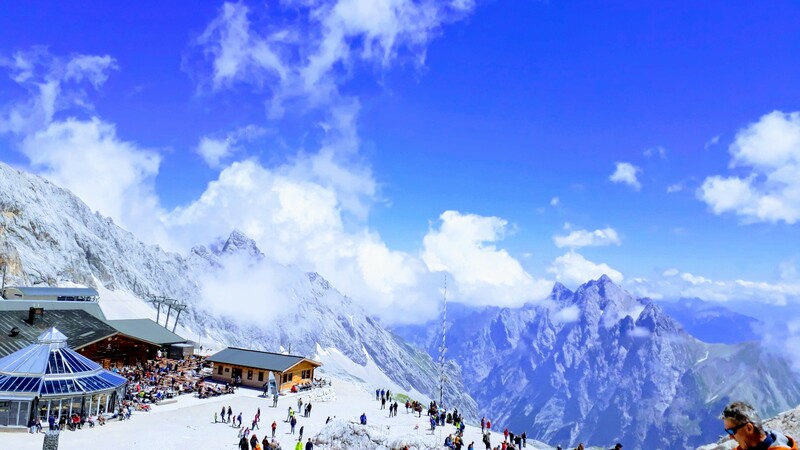 Eighteen teams took part this year including local German teams, teams from Switzerland, Luxembourg and the Ukraine. 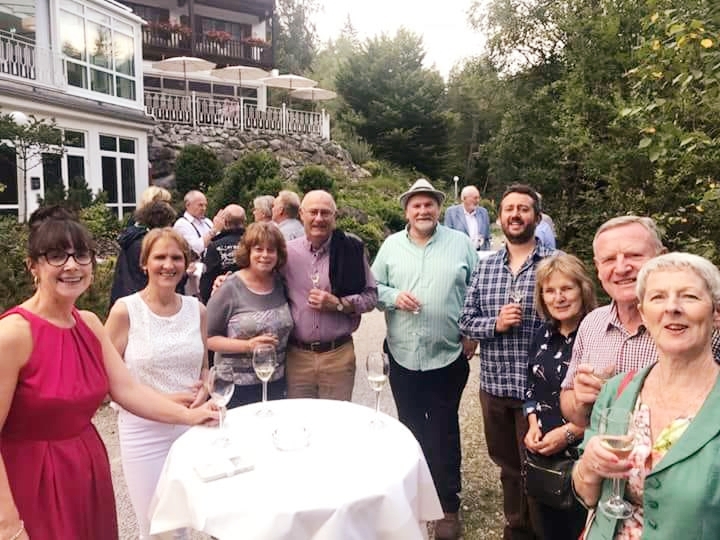 The ICA party enjoy drinks beside the lake before dinner outside the hotel in Grainau. The organisers did a fantastic job hosting the event with a drinks party the first evening, a barbeque the second night and a superb grand dinner at a hotel in Grainau, at the base of the Zugspitze mountain, on the final evening. 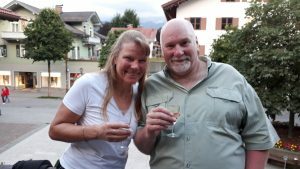 A special thanks from everyone to Arran Cameron who undertook the bulk of the organisation for the trip. 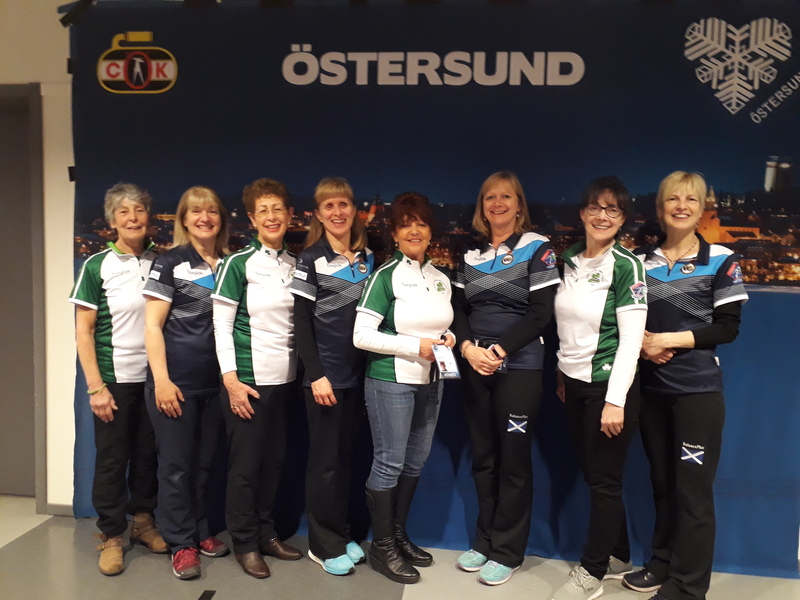 Another defeat here in Ostersund this morning against a very accomplished Finnish team. 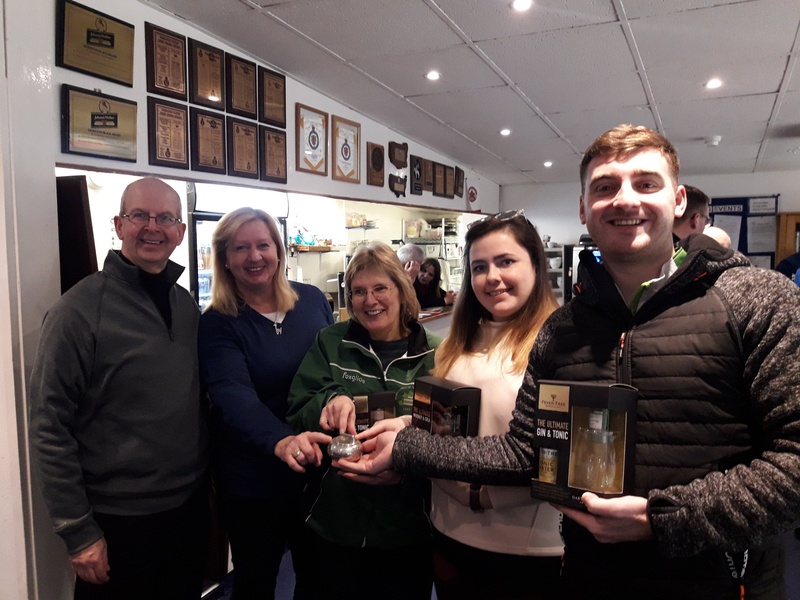 The Irish once more won the draw shot challenge, thanks to Christina and Clare, but, apart from a good second end were out-curled by the opposition. Two of them live on a small island called Aland, half way between Finland and Sweden, where there is a curling rink! One more game to go against Latvia tomorrow. 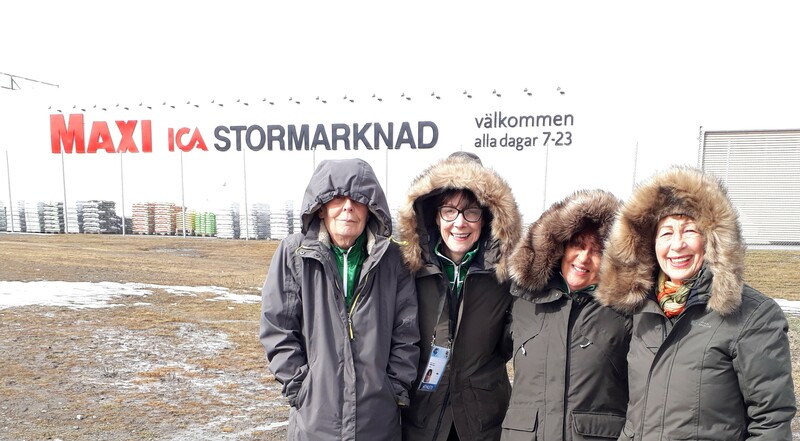 After the curling and before supporting the men in their crucial game against the USA, the women walked to the nearby ICA Supermarket! There we found a cafe with coffee and cakes at reasonable prices! 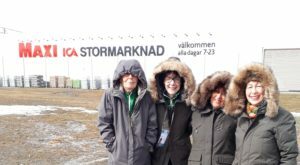 The name tickled us so much we had to get our coach Gerry to take a photo of us outside. 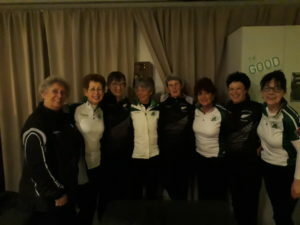 After winning the DSC and taking a one in the first end, the Irish ladies were blown away by a very classy Scottish ladies team who took a game-changing four in the second end, when a Irish tap up to lie two drew too far, opening up Ireland’s shot in the four foot for the Scots to hit out. The Irish plugged on trying to draw behind cover, but the Scottish women snuffed out every opportunity with accurate hits and after the obligatory six ends were over the Irish conceded the game. 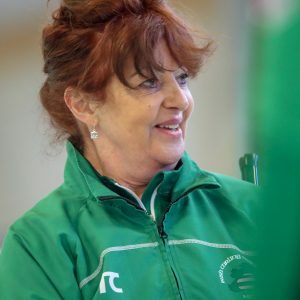 Two early morning games now for the Irish at 8am tomorrow against Finland that the same time on Thursday against Latvia. 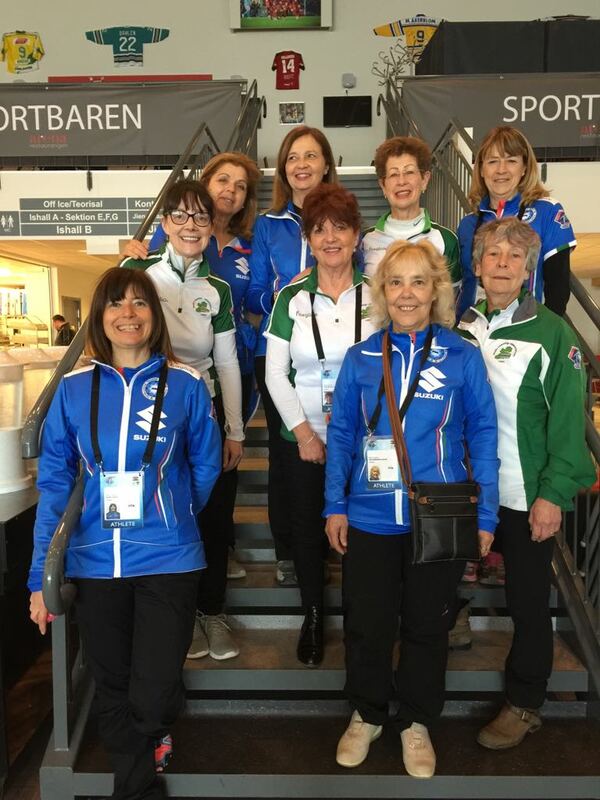 Despite the obvious blot on the copybook – losing a five in the seventh end – the Irish women played their best game of curling so far against Switzerland here in Ostersund at the World Seniors. The front end of Clare and Christina locked onto the speed of the ice, and skip Marie brought a round of applause and shouts of “great shot” in the second end with a superb draw to the bite the button out-counting the guarded Swiss shot by a couple of inches. 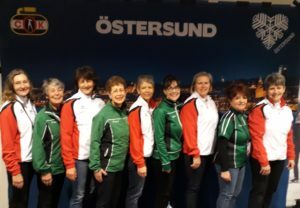 The Swiss were not having their best game it must be said, but the Irish outplayed them for much of the contest, and when their skip came up short with her last stone against three in the sixth end, Marie coolly drew to the four foot to tie the game up at five all. But trying the keep things clear in the seventh undid the team with crucial missed take outs leaving Switzerland lying four. Marie trying to get a wick of a stone in behind cover but when it over-curled and sailed through the Swiss took a five. The Irish played on in the eighth until they were run out of stones. The Irish senior women had a busy day here in Östersund starting at 8am this morning against Italy, a game they won 7-6. Then it was back on the ice 12 hours later for their second game of the day against New Zealand. 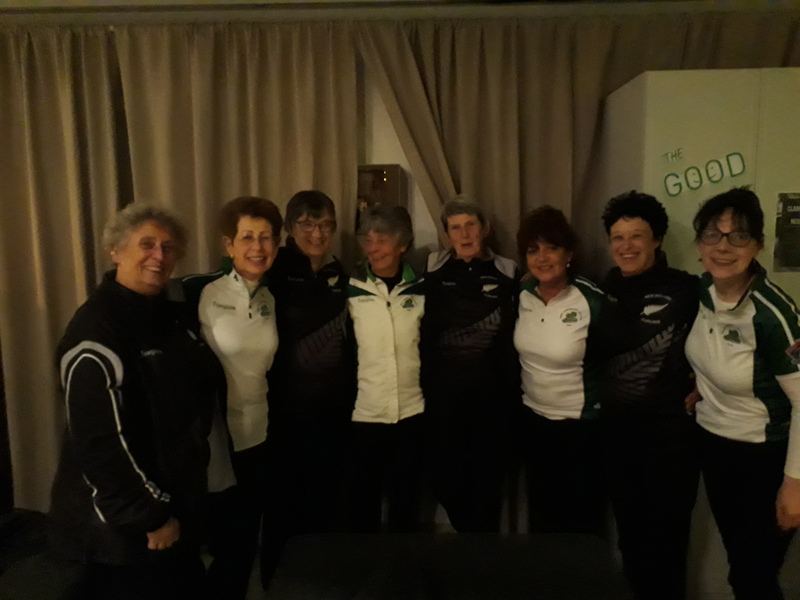 The Kiwi ladies managed to steal the shot over a succession of ends but thankfully the momentum swung back in Ireland’s favour with a four at the seventh end to level the scores at 5 all. In the last end the Irish managed to get two draws into the four foot behind a wall of stones and the New Zealand skip couldn’t get near them. Ireland therefore took their second win of the day by a score of 7-5. 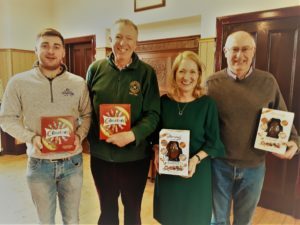 James, David, Margarita and Bill with their prizes. 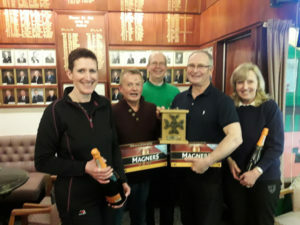 Congratulations to James Russell, Bill Gray, Margarita Sweeney-Baird and David Hume who won the ICA closing bonspiel at Greenacres today. 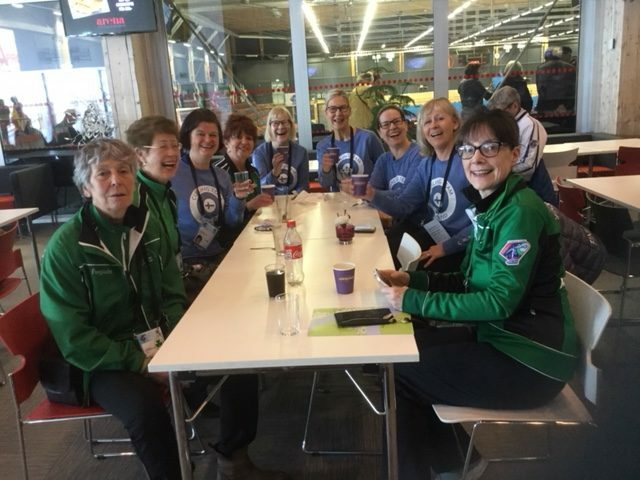 Six rinks were on the ice with many members staying on for the annual general meeting in Gateside Hall and the meal in the pub afterwards. Johnjo Kenny 7 Andrew Gilmore 6; James Russell 10 Arran Cameron 8; Marie O’Kane 5 John Furey 5. Another enjoyable ICA Stranraer Weekend at the North West Castle Hotel and Ice Rink complex ended with a win for Team Wilson, but it wasn’t PJ or Peter skipping his team to the top spot this year, but John Wilson, PJ’s son. It was a changing of the guard moment when John, ably supported by Katie Stevenson and Lyndsay Spence from Lockerbie, and his old Stranraer Academy school mate Andrew Chambers, swept through their four games undefeated, taking the Granite Trophy with a comprehensive victory over Johnjo Kenny, Gillian, Russell, John Burns and Russet Fullarton in the 1v2 high road final round on Sunday afternoon. 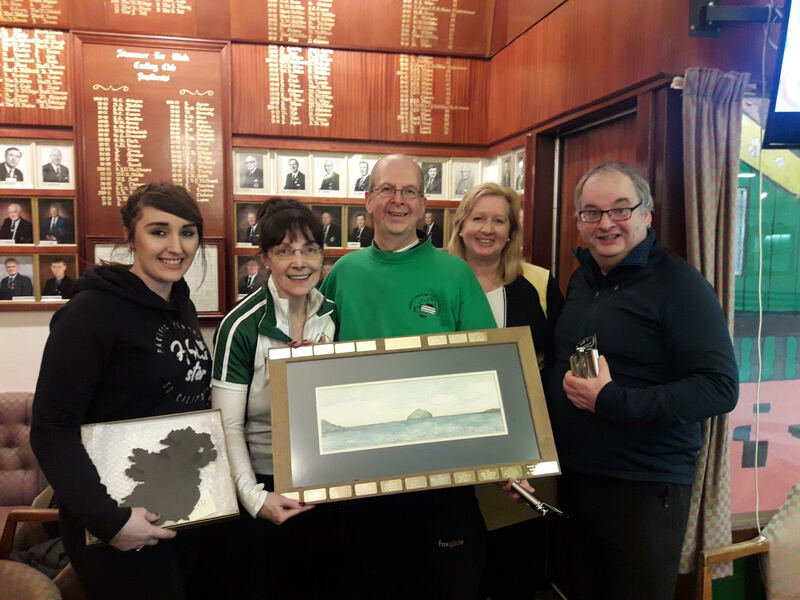 The runners-up in the high road and winners of the Ailsa Craig painting by Jane Paterson were the team of David Whyte, Kara Compton, John Ferguson and Frances Whyte, who finished on the same points as PJ Wilson’s team, but just squeaked second place by one end with 17 ends scored. 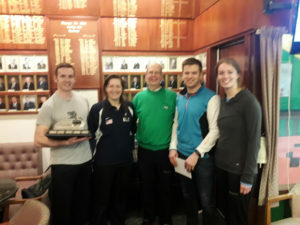 The low road winners of the Irish Oak low road trophy were Billy Johnston, Kate Adams, Gordon Adams and Elspeth Johnston and the low road runners-up, taking home the Basil Gray Memorial Trophy were Stuart Wilson, Elaine Turnbull, Tommy Campbell and Anne Wilson. A raffle at the Saturday night reception in the North West Castle Hotel raised £270 for ICA funds. The ICA also welcomed Canadian curler Matt, currently based in Dublin, and hope he comes back to play with us on a regular basis. A most enjoyable spring bonspiel was held on Sunday at Kinross. 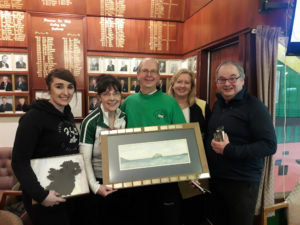 The event was won by the rink of James Russell, Frances Whyte, Gillian Russell and Niamh Begley, who were presented with the perpetual trophy and prizes by ICA President David Whyte. 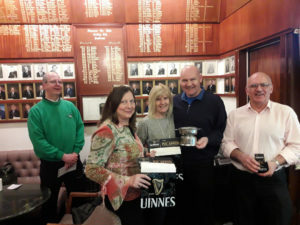 The Association was delighted to welcome three potential new members – Maria O’Neill, David McHale and Niamh, one of the winners. Someone out there won a bottle of ‘Echo Falls’ summer fruits fusion wine in a silver bottle bag last Saturday night in the raffle. It ended up in my carrier bag down in the function room at the NWC. Does anyone remember winning it? 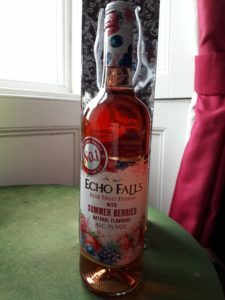 If it’s not claimed it will go into the Irish Weekend raffle next month. And a new boy band was formed the same night. They are hoping to get a summer season gig at Bantry…….if Eoin gets his world tour over in time.